WHAT’S STOPPING YOU FROM BEING YOUR BEST? YOU ARE! If you’re suffering from stress, anxiety or negative thoughts, then Unlock You is your simple, six-week plan to feel calm, kick that bad habit and release your potential to be your best. 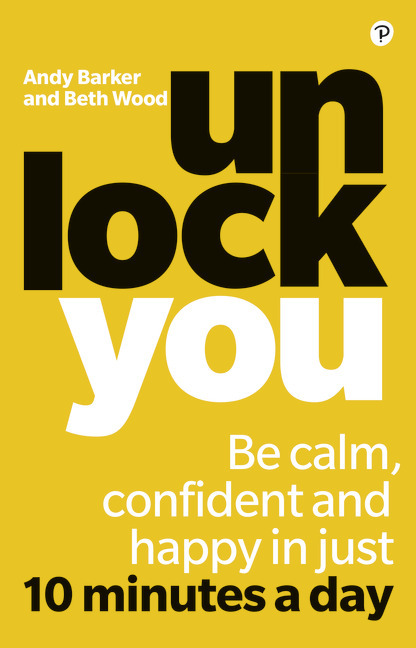 Unlock You is a special programme designed to give you the skills and tools to be calmer, happier and more confident. When challenging situations arise you will be able to deal better with them, and cope in a crisis. Using mindfulness, emotional intelligence, CBT and the latest findings from neuroscience, this book doesn’t just change the way you feel but the way you act and react. By building the programme into your daily routine you’ll be a better partner, parent, friend, employer and employee. As you gain knowledge about yourself and what you need to do to change your life, we will guide you as you turn the programme into a personal road map. You will build this into a six week programme that embeds easily into your daily life – a daily life that will continue to get better and better. · Recognise a negative or unhelpful belief and be able to replace it with a more positive one. · Remain focussed and not let your negative thoughts take over. · Understand which kinds of stress are good and which are bad. · Recognise when you’re in ‘fright or flight mode’ and how to quickly calm down. · Set goals that are attainable and in line with their beliefs. · Know which emotions are negative and unhealthy, so you can accept and work to change them. · Learn the importance of emotional intelligence and methods to develop compassion and empathy. Beth Wood is Director and Trainer at Mind Fitness. Beth has undertaken corporate work for ACT, Theatre Exchange and for her current company Prospero Theatre. This work has centered around developing training in communication skills, voice and public speaking, team working and most recently Mindfulness and Inclusion in the Workplace. Clients have included Friends Provident, Legal and General, the Co-op, Babcock, several Day Centres, Ann Summers and the Lay Preachers of Surrey. Andy Barker is Director and Trainer at Mind Fitness. Andy is a certified Cognitive Behavioural Coach and trainer with a diverse work experience that encompasses the arts (he was a theatre stage manager in London’s West End) and corporate leadership. He spent 20 years at Sony, gaining invaluable senior management knowledge in a fast-changing business environment, fostering a passion for personal development that eventually led him to train and specialise in Cognitive Behavioural Coaching. Andy also works in a variety of business sectors through his coaching and training practice ABC Ltd, retaining close links with the tech industry. He speaks regularly at international conferences for a range of clients, and is currently designing an online Training Academy for Contact Centre World.